Memory Lane Friday is a weekly blog hop where you can blog about your memories and link up. I hope you'll join in today, all are welcome! The topic is 'A Store'. I've blogged before about the rural farm in Glade Springs my family inhabited when I was seven years old. That year of my life is rich with memories and adventures. While it was likely my parents' least favorite place we ever lived, from a kid's point of view it was my favorite. Down the rural backroads, in the middle of nowhere, was a little store. You know the type. Fits "Mom and Pop" to a tee. I don't recall the real name of this place, but my brother Taylor called it The Sucker Doggie store. So that's what we always called it. We'd be driving past and my brother would start hollering, "Sucker Doggie Store!" and then we'd have to stop. He called it the Sucker Doggie Store because when you went inside the suspender-clad elderly man who ran the place had a sidekick in the form of a bassett hound, lazing on the floor. Taylor loved that dog. And before we left, the owner would always give Taylor a lollipop for the road. The Sucker Doggie Store is also the location of my last purchased Moon Pie. I was sick (with strep throat) and we were on the way back from the doctor's office. My Mom felt bad I was so miserable and stopped so Taylor and I could get a treat. I picked a Moon Pie and proceeded to dive into it on the way home. We didn't make it all the way home before I tossed my cookies (or, um, cookie) in a paper bag. Since then, I haven't been able to eat a Moon Pie. You can link up below if you'd like, just add your website to the linky. Don't forget to come back next week - the topic is 'A Favorite Subject'. Sucket Doggies' store sounds like a great place to explore. Ohhh, I love Moon Pies!!! Haven't had one in several years. Sorry that they're ruined for you! Where people know my name--I haven't had that feeling in ages! Sorry about the Moon Pie. But I love the name "Sucker Doggy Store"! I got sick on peanuts once and it was years before I was able to eat them again. I wonder if they still make Moon Pies? 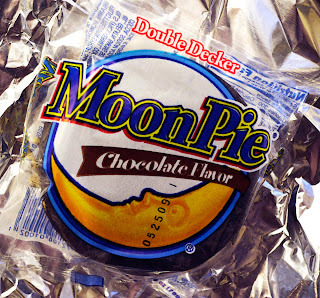 OMG, I forgot about moon pies! I'm that way about foods. If I ever toss them back up...I can't manage to eat them again. Mushrooms, one of my all time FAVORITE foods...I shudder walking past in the grocery store now. All because of a horrid virus back at the first of the year. Really cool about the store though. I had one a couple blocks from my house growing up that I use to get pina colada slushies at. Yummo! i have never eaten a moon pie. i am afraid.